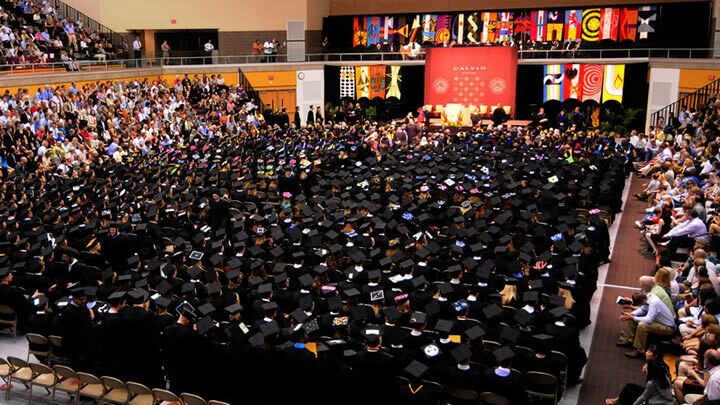 A week ago, I was enjoying the splendor of commencement day, saluting some fine young people that Calvin College has now unleashed on the world. (Yes, you’re welcome, world.) This fresh new batch of graduates includes my own daughter! It was my first experience as the parent of a grad, and it’s a good thing academic regalia is roomy, because I felt rather inflated with pride. While I am especially proud of my own offspring, I am, as usual, proud of our English department graduates, too. As I finished up my grading this week, I found a pile of papers my seniors had written earlier in the semester for the English major senior capstone course. They were asked to reflect for 5-7 pages on their very favorite topic: vocation. Ha ha. Just kidding. Vocation was not their favorite topic. In fact, they complained that they were sick to death of it after four years of constant hammering. Even so, we enjoyed two days of jolly and therapeutic conversation in class, and then they wrote a set of winsome, insightful, honest reflections. I thought Twelve readers might enjoy a brief tour through the minds of one little sliver of the new generation. We had spent some time in class dissecting Frederick Buechner’s famous dictum: “The place God calls you to is the place where your deep gladness and the world’s deep hunger meet.” Students expressed initial appreciation for this idea, a sense of inspiration and significance. Then things got complicated. What exactly is “the world,” they wondered? And do our lives really have to be all that grand? Another student reflected on how easy it is to define “gladness” and “hunger” in trivial ways—she chased down a ridiculous scenario in which Buechner’s formula eventually led to throwing ninja stars at teenagers in Wal-Mart in order to protect little old ladies. To satirize all of this, one wag wrote a scathingly funny piece of fiction in which a Calvin student named Tyler Vanden Dutch, after meandering aimlessly around Calvin for a year, prays to receive a revelation about his vocation. God comes to him in a flash of light and tells him to go into business. He obeys, and after graduation he spends ten unthrilling years working for a produce company as a buyer. So poor Tyler prays again, begging God to explain why, having following his God-ordained vocation, he’s so unhappy. Well, it turns out there was a mix-up, and Tyler received the divine signals meant for another Calvin student named Tyler Vanden Dyke! The piece ends with God explaining to Tyler #1 that not everyone gets a vocation, so get over it. There are lots of plain old jobs that need to be done, and he’s lucky to have one. I thought these were wise words indeed. I have been myself at times rather cynical about the concept of vocation. Certainly I’ve been critical of it, in print. Having hashed over this topic yet again with some weary seniors, though, I have to admit that talking about vocation yields some beautiful results. I come away determined to continue correcting our flattened and damaging notions about vocation, but also to continue raising it as an area of theological and spiritual reflection. However fraught, vocation discourse is one way in which we invite one another to think seriously about the meaning of our lives. How beautiful to remind one another that purpose and direction is not all about me, me, me, but about the larger kingdom purposes of God, the gifts given us by grace, and service to others. This gives us each a significance more durable than anything “the world” can offer. Many thanks to the students quoted here for their wisdom and honesty. I kept you anonymous to protect your privacy. The senior sem group was wonderful all semester, and I’ll miss you all.